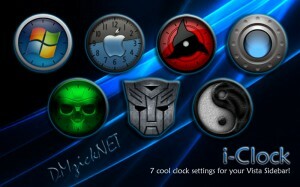 You can’t get any more cool then this set of clocks for Windows Vista. There’s a design for everybody in this set of 7 clocks. My personal favorite is the Windows clock. I know it may not be as cool as the other ones, but I always enjoy simplicity and integration with the whole desktop. With the Windows clock it will fit almost any designs. I’m thinking that most people will like the transformers one the best.